It has been a crazy month. Crazy, but so much fun. This month I worked on edits and then sent that manuscript back for the 3rd pass of editing, re-worked a manuscript that will go to the editor on Friday, worked on another short story I will send to the editor in February, played with a short story for an anthology I’m going to participate in, and spent some time doing other creative things. Writing is not my only creative outlet. I like to crochet, knit, tat, silversmith, bead, and do many other crafts. If you’ve read some of my previous blogs you know that my grandkids keep me busy making things for them. 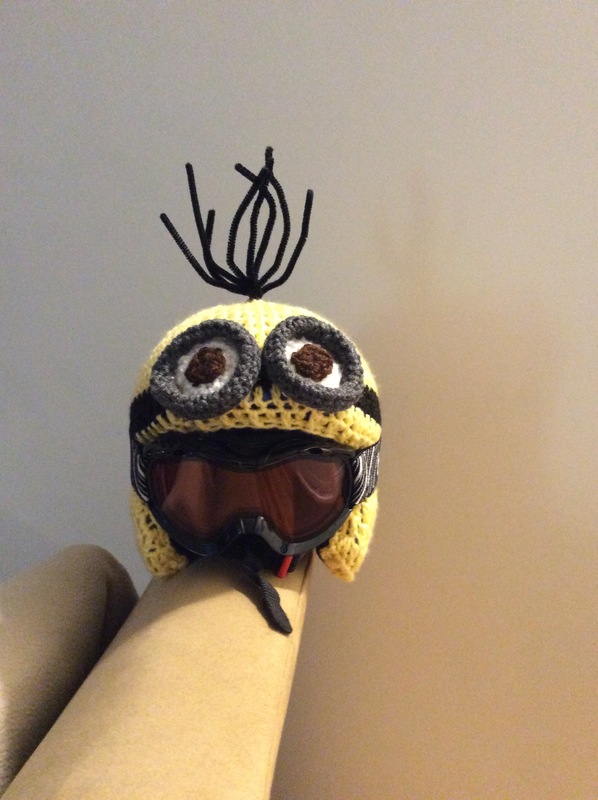 This weekend it was a ski helmet cover for my grandson. He is a little over 2 years old and is totally captivated by Minions. Nana was tasked with making a Minion look-a-like cover. Of course, there is no pattern available so it was all done by trial and error, just as his sister’s cover, Twilight Sparkle – My Little Pony look-a-like, was last year. I really enjoy the process of starting with only the raw materials and figuring out how to get the end product to look close to what it should. This is the reason I enjoy writing by the seat of my pants. I gather some points/ideas about the story and type them on the first page of the manuscript but I never do a full outline. It’s like crocheting without a pattern. You have the raw materials gathered, and you know sort of what you want it to look like in the end, but the journey is a bit of trial and error until it is complete. Most times it ends up even better than you ever expected. This trial and error is the fun part for me. You discover things about your project and the materials that you may not have known before, and a whole lot about yourself too. As much as I love writing, I can’t sit at my computer for 12 hours a day so I always have other crafting projects on the go to work on and keep me busy. The time spent on the other projects can be useful for writing too. Great ideas come when your hands are busy and mind is free to wander. Even if you’re not having problems with your story you may get great ideas for a plot twist or other story events you didn’t think of before. Win-win: you get great ideas and a finished gift for yourself or someone you care about.